A new £135,000 hovercraft has been put into service in Essex to help rescue people who become stranded in mud. The Royal National Lifeboat Institution will use the craft at Southend where low tide can leave a mile of mudflats. The RNLI said it will cut the time it takes to rescue people trapped on mud or sand banks to eight minutes - a lifeboat launch would take 20 minutes. The hovercraft, which can travel at about 30mph, can also launch from the end of the pier at low tide. 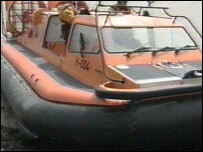 Southend was one of a number of test locations chosen for the hovercraft because of the extent of the mudflats which can inhibit a traditional lifeboat.